The Minister of Interior, Abdulrahman Dambazau, has said former Vice-President Abubakar Atiku who is the candidate of the main opposition party, the Peoples Democratic Party is no match for the ruling All Progressives Congress’ candidate, the incumbent President Muhammadu Buhari. 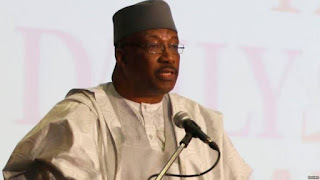 Addressing journalists at the APC National Secretariat in Abuja, Dambazau said while the President had used his position in and out of office to better the lives of people, Atiku had not impacted lives outside his immediate circle. He spoke through his Senior Special Assistant and former Chairman, House Committee on Security, Aliyu Gebi. According to him, “In this race (2019), there is only one gladiator and that gladiator is the current President. So, there is no contender. (Atiku) by saying this is the toughest election in the history of Nigeria, yes toughest for him, certainly not for the President. Dambazau said the country had decimated Boko Haram, adding that the insurgency was in his last days despite the recent attack on Melete where soldiers were killed. The former Chief of Army Staff said with the Chief of Defence Staff, Gen. Gbenga Olonisakin, taking a centre stage and promoting cohesion among the service chiefs, it was a matter of time for the insurgency to be completely wiped out.